With eight Bundesliga titles, six DFB Cups, a UEFA Cup and a Champions League winner’s medal to his name, many would be forgiven for thinking this position was a formality for Kahn. Yet there are many Bayern fans of a certain age who remember both him and Sepp Maier between the sticks in Munich and are torn between their pair. In a poll run by Bayern in 2005, fans picked the latter, but Kahn was still playing at the time – and being coached by mentor Maier. Despite Maier being a one-club man, it is still Kahn who holds the club’s record for appearances (632 – 31 more than Maier) and on his retirement in 2008 was named Bayern’s honorary club captain, which is why he wears the armband in this team. To date the only goalkeeper in history to be awarded the Golden Ball for best player at a FIFA World Cup (in 2002), Kahn - frequently referred to as “King Kahn” - was a giant of the German game famed for his shot-stopping, distribution and overall command of his box. Yet he is more popularly known as “Der Titan” (“The Titan”) for his formidable presence both on and off the pitch, never afraid to have a “quiet” word with opponents and teammates alike. A Munich boy through and through, Lahm had been at Bayern since the age of 11 until his retirement in 2017. Rarely injured, he was an all but permanent fixture in the Bavarians’ team following his return from a two-year loan at Stuttgart, including a spell between April 2009 and September 2011 when he featured in every minute of Bundesliga action for the club, having seen off challenges from other legendary full-backs Willy Sagnol and the club’s current sporting director Hasan Salihamidzic. Described by coach Pep Guardiola as “the most intelligent player I’ve ever worked with”, Lahm wasn’t just versatile, playing regularly at both right-back, left-back and in central midfield, but masterful in whatever position he was asked to play in. The first and so far only Bayern captain to win the coveted treble of Bundesliga, DFB Cup and Champions League, Lahm’s place in club history is secured. One year later he even led Germany to World Cup glory in Brazil before seeing out his career with a record-equalling eight Bundesliga titles, six DFB Cups and that famous Champions League triumph. Quiz: How well do you know Philipp Lahm? Every bit the Bayern and Germany legend, the man known the world over as, Der Kaiser – or The Emperor – was there at the beginning in terms of the Bavarians’ current day Bundesliga dominance. Beckenbauer took his first steps in the game as an 1860 Munich striker and then midfielder, before inventing the role of libero (sweeper) at Bayern. Having captained the men in red to their first Bundesliga title in 1969, Beckenbauer’s name became synonymous with success during a run of three successive top-flight championship wins between 1972 and ’74, and a hat-trick of back-to-back European Cup wins between 1974 and ’76. The FIFA World Cup and European Championship winning captain with West Germany later moved into management, and after guiding his country to a 1990 World Cup win, enjoyed two brief stints as a coach at Bayern that garnered one more Bundesliga title and the 1996 UEFA Cup. Twice a European Player of the Year, Beckenbauer later held posts as Bayern president and advisor to the board. Another in the mould of central defender-turned-sweeper, Augenthaler won an incredible seven Bundesliga titles between 1980 and 1990, the year he played under Beckenbauer in Germany’s World Cup win. A native of Bavaria, ‘Auge,’ as he is known, began his Bayern journey as an 18-year-old and went on to spend 15 seasons at the club, featuring in over 400 Bundesliga games and also captaining the side. Famed for his fearsome free-kicks and keen eye for killer pass, Augenthaler played 50 times in the DFB Cup, a trophy he lifted three times. After hanging up his boots, he enjoyed a relatively short management career that included five years as assistant coach at Bayern. Recalling his phenomenal success as a player, Augenthaler recently said after turning 60, “When I stand on the grass and see the ball, I'm 20 years old again." A controversial character off the field in his day, Breitner was one of the world’s best players on it. The man with the famous beard debuted for Bayern as a mere teenager at 18, playing a full-back role that is more akin to the modern-day version, combining speed down the flanks with accurate crossing. In the first of two spells with the Bavarian giants, Breitner won three of his five Bundesliga titles, the first of two DFB Cups and the 1974 European Cup. A hugely publicised switch to Real Madrid followed, with Breitner successfully moving into midfield and winning a league and cup double in his first season in Spain. Adding another top-flight title prior to leaving Madrid, the 1974 FIFA World Cup and 1972 European champion with Germany returned to Bayern via Eintracht Braunschweig in 1978. Instated as captain, Breitner added two more Bundesliga titles before his playing career drew to a close in 1983. A player who arrived in Munich with a reputation as one of Europe’s most talented wingers after spells across the continent, Robben found a home for himself at Bayern and is now in his ninth season at the club. Despite what could be described as a simple style of play, the Dutchman has made it his own. The idea of a left-footed winger cutting in from the right onto their stronger foot and looking to shoot is now referred to by many as the “Robben”. Defenders know he’s going to cut inside, but they still can’t do anything about it, of course helped by the chemistry he developed with Lahm down the right flank, who would often overlap and create the space for the Dutchman inside. Even at the age of 34, Robben is still able to perform at the highest level, doing what he’s done best his entire career. And what a glittering career it’s been in Munich: Six Bundesliga titles, four DFB Cups and the 2012/13 Champions League as part of that treble. And despite his position on the wing, Robben was the club’s highest scoring non-German in the Bundesliga until overtaken by Robert Lewandowski in January 2018. There is, however, one goal alone why Robben will forever be remembered and lauded by Bayern fans: His 89th-minute winner in the 2013 Champions League final against Borussia Dortmund. “Mr Wembley” will always hold legendary status in Munich. A scorer of 100 goals in 410 appearances in all competitions for Bayern during two hugely successful spells at the club, midfielder Matthäus was once acknowledged the world’s best player in his prime. Having honed his skills under Jupp Heynckes at rivals Borussia Mönchengladbach, the mesmerising midfielder moved to Bayern in 1984, immediately winning the Bundesliga and following that with a league and cup double soon after. Later, with three top-flight titles in a row secured, Matthäus moved to Italy with Inter Milan. Another of Bayern’s players to have been crowned World and European champion with West Germany, Matthäus returned to Bavaria in 1993 and began to experiment in the sweeper role. Another four Bundesliga titles were wrapped up in the proceeding years, as were two more DFB Cups and the UEFA Cup in 1996. A tribute to his persistence and durability, Matthäus recovered from several injury setbacks to play top-level football until he was 39, even appearing in five World Cups. Watch: Viva Matthäus in Colombia! Born in the same Bavarian town as Breitner, Schweinsteiger spent close to two decades in Bayern colours, making exactly 500 appearances for the club before moving on to Manchester United and later Chicago Fire. Handed his senior debut at 18 after just two training sessions with the first team, Schweinsteiger originally failed to nail down a single position, featuring both in defence and on both wings in midfield. Within time he blossomed into a complete midfielder, pulling strings for both club and country, and going on to win the treble in 2013 and the World Cup in 2014 with Bayern and Germany respectively. Described at the time by coach Heynckes as “the best midfielder in the world” and by Joachim Löw as “the brain” of the Germany team, Schweinsteiger masterminded Bayern to a record eight Bundesliga titles, seven DFB Cups and that Champions League triumph at Wembley. Possibly the greatest non-German to appear in Bayern colours, no other foreigner has played more games for the club than the French winger despite his problems with injuries down the years. Along with his partner in crime Robben on the opposite wing, Ribery has tormented opposition defences for the best part of a decade in Munich. Capable of cutting inside or keeping wide, Ribery has been both a prolific provider of goals and assists – in terms of the latter, he in fact holds the club record. Despite being 34, Ribery recently declared he had plenty of good years remaining in a career that has seen him collect seven Bundesliga wins, five DFB Cups and the Champions League, among other titles. An eighth domestic title in Germany looks probable this year, but can the Frenchman hold on for one more next season and claim a league-record ninth? Already showing immense promise as a prolific goalscoring youth, the player who later became known as ‘Der Bomber’ signed for Bayern in 1964. After scoring on his debut, a deluge of goals followed as the team gained promotion. With the dawning of the 1970s, Müller revelled in one of the world’s greatest sides that swept up domestic and European honours. In the 1971/72 campaign, for example, Der Bomber hit 40 Bundesliga goals, a record that stands to this day. 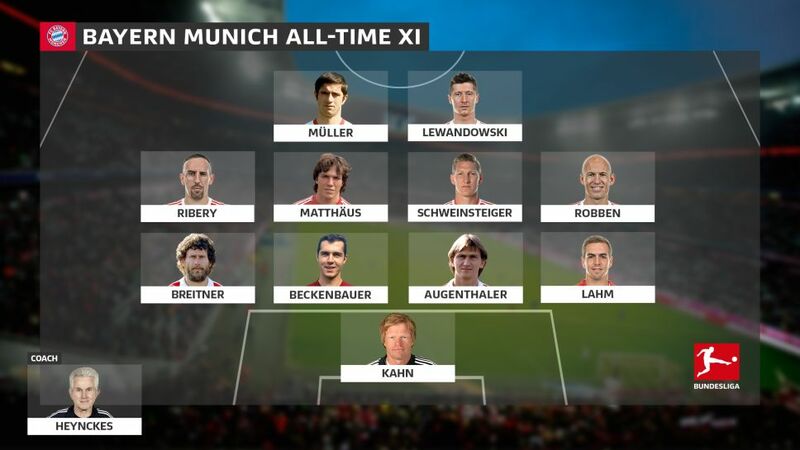 Part of the aforementioned team to win a hat-trick of German top-flight titles and a European Cup treble, Müller would finish his career having been the Bundesliga’s top scorer an incredible seven times. An astonishing 13 title wins in 10 years with Bayern comprised of four Bundesligas, three European Cups, four DFB Cups, the European Cup Winners’ Cup and an Intercontinental Cup. With Germany, the spectacular striker was also a World and European champion. Heading the list of the all-time Bundesliga top scorers, Müller is unmatched at the summit on 365 goals. Arguably one of the world’s top players at the moment, the prolific Pole will go down in Bayern, and Bundesliga, folklore when he eventually calls time on a distinguished career. First exploding onto the scene in Germany with Dortmund – where he was twice a Bundesliga winner and top scorer – Lewy made the switch to Säbener Straße in 2014. He has been a league winner every season since then, and with 30 top-flight goals in the 2015/16 campaign – when he added a DFB Cup – once more held aloft the Torjägerkanone. Lewandowski continues to rack up the records at Bayern, most recently becoming the club’s highest scoring non-German player to add to his achievement of reaching 100 top-flight goals quicker than any foreigner. He also amazed the watching world when registering five goals in just under nine minutes – a Guinness World Record – in a 2015/16 Bundesliga game against Wolfsburg, even achieving the feat as a substitute. Watch: Lewandowski tackles your questions in "60 Seconds Under Pressure"
A legend as a player with Borussia Mönchengladbach, Heynckes also holds cult status in Munich. Ottmar Hitzfeld may have won more silverware at the club, but Heynckes is the coach who secured the longed-for treble of Bundesliga, DFB Cup and UEFA Champions League for the first time in the club’s history in 2012/13. Heynckes was actually sacked by the club in his first spell, which then general manager Uli Hoeneß later described as “the biggest mistake of my career”. Yet he has continually been a go-to man for the record champions, winning silverware during both of his permanent tenures so far. Now in his fourth spell in charge of the club, the 72-year-old has turned around a five-point deficit to Dortmund at the time of his appointment into a seemingly unassailable lead at the top of the Bundesliga standing and putting Bayern well on their way to an unprecedented sixth consecutive league title and yet more honours for the 2013 FIFA World Coach of the Year. Click here for more Bayern Munich news, views and features!